Description: Gambini (the man behind Rush2k) and DeeperThought's project is a detailed city/outdoor/industrial/hi-tech map with some new gameplay enhancing DukePlus (included) effects. Design: I'm amazed by the amount of details in the map just as I was when playing & reviewing Rush2K. Complex spritework covers every inch of the map so that you wonder how Gambini had the strenght and patience to build all that. You wouldn't even believe you're playing a game that's not fully 3D: Gambini has gone to great lenghts to bypass old restrictions. (When you step outside for the first time, notice the truck that passes a bridge underway while there's a train moving on the bridge.) 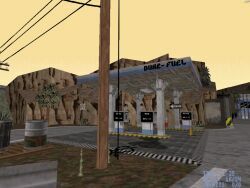 And while Rush2K was quite standard hi-tech stuff with several outdoor areas, Blown Fuses features numerous fresh locations from an apartment building to an industrial area that reminded me of Half-Life 2. 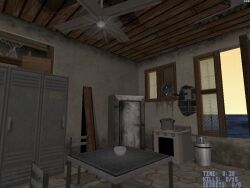 Gameplay: You'd think that with all these details there's a tradeoff between lenght and architecture but there isn't. 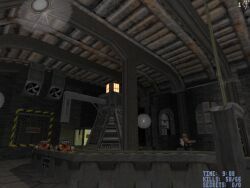 The map should take you around 20 minutes and it's not just about finding keys: DukePlus has been used to enhance the level's gameplay. For example, you have to find several fuses (you can pick up any sprites as if you were playing Half-Life 2) to activate various sequences. Maybe the most amazing new feature was the Dukebot, a friendly NPC that is needed to accomplish various tasks (opening doors). There are also some scripted sequences, new enemies and new effects. My only disappointment is the ending, a rather poor one after such a great ride. Conclusion: Maybe the most detailed level with plenty of variety. The level really benefits from DukePlus, especially from its Dukebot feature, and should last several playthroughs. It doesn't quite beat Red 4 or Red 5 maybe due to lack of really atmospheric gameplay.